We offer perfect roll-up and pop-on offline captions in both English and Spanish, for Latin America and the US Hispanic market. 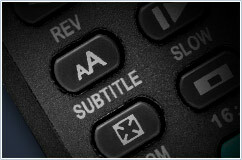 We work with your master tape or video file (tapeless encoding) in any of our supported formats. We can deliver a master tape with captions, a video file with captions or a file to work directly with Avid, Final Cut Pro and Adobe's Creative Suite NLE systems.